I don't think I have ever tasted no-bake cookies, Kitty. Love the photos of you and your gorgeous family. The children are growing quickly aren't they. Love the summery feel of this post. 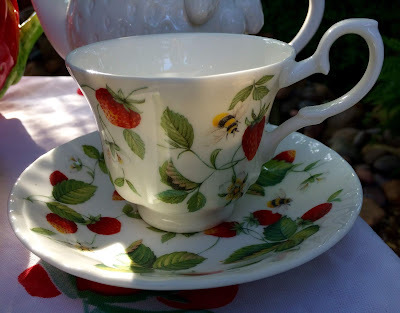 That tea cup is so pretty with the strawberries and little bees and the strawberry plate is very cool. 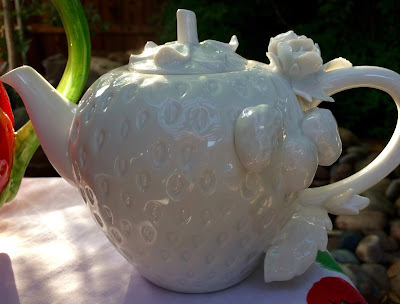 Love your teapot as well; love all the three dimensional details on it. Wow, no bake cookies, that sounds dangerously easy! Such cute cute photos!! I enjoyed looking and the photos and those cookies sound so good and easy to make. Thanks for sharing the recipe at Cooking and Crafting with J & J.
I'm loving this week's cute strawberry-themed tea setting. Congrats on the school grads. Your sweet grandkids are growing up so fast! I've made no-bake cookies before using coconut flakes, but I'll have to try your PB version! How cute and I may have to make these with one of my Granddaughter's. I think I've made these many moons ago but thanks for mentioning them as I had completely forgotten about them. Happy new week! Love your teapot Kitty, I would be extra careful with it too. Love all the strawberry serving pieces along with the cup and saucer. 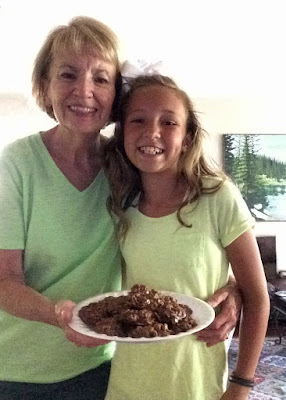 Cissy and you are adorable together with your cookies. I’m sure her family look forward to treats she brings home. What handsome young men you have and grow up so fast! I’m loveing the ease of this delicious recipe. Have a wonderful week. Your family is adorable,Kitty!I also love your Strawberry tablescape,so sweet!That teapot is fabulous and I love all of your gorgeous china!The pitcher with white flowers is very pretty.What an amazing post!Hugs! Congratulations to al the graduates! No wonder it's no bake cookies...things must be pretty busy and exciting around your home! Love the strawberry teapot, and I love the RH strawberry pattern! Thanks for linking to Tuesday Cuppa Tea! Your teacups and teapots are always lovely! Please tell your family that their pictures are wonderful! 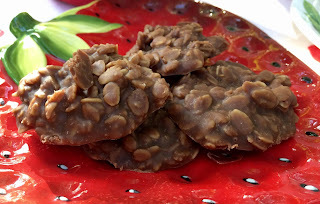 You know...I have to confess that no matter what wonderful recipes there are out there for fantastic desserts, no-bake cookies will be a go-to favorite every time. My mom made these all the time when I was growing up and it also served as her fudge recipe minus the oatmeal. Just a few weeks a go, one of our patients was so sweet to bring me and the therapist our own plates of these yummy treats! Cissy has the sweetest dimples! That Cissy and her million dollar smile makes me grin every single time I see her. Congrats on her graduation and congrats also to Riley. You sure have a handsome bunch of grands, beautiful, too. (Gotta cover all the bases.) I haven't had no bake cookies in so long. They were a favorite for years and years. 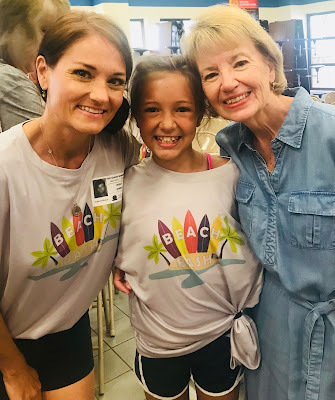 I loved seeing the sweet pictures! God has blessed you with a beautiful family, my friend! Praying for you and sending hugs! A lovely post with sweet memories in the making. Kitty, you always make me hungry when I visit! Wonderful pictures and a busy family!!! What a wonderful posting and those cookies must of made the family very happy. Cissy is getting so much wonderful experience! 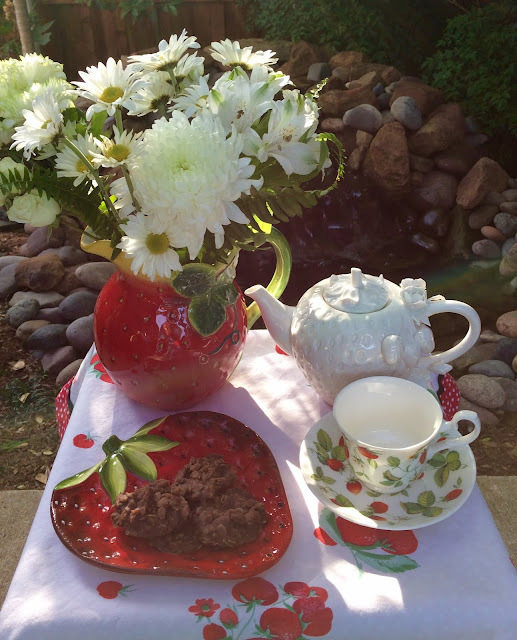 What beautiful strawberry tea and dishware to use with your delicious cookies! And what nice pictures of you and your grands. Nothing better in life than family! Such sweet pictures of you and your family! Thanks for visiting my blog....I would love to sit on my front porch with you and chat! Hi Kitty, you look just like one of the kids. :) I love no bake cookies, but never thing to make them. Thanks for sharing with SYC. How wonderful to be able to share in your grandkids graduation festivities, Kitty! Love all the photos :) Those no-bake cookies sound delish! We love No Bake Cookies in our house. My son could eat them everyday. Delicious. Cute strawberry accents. Congratulations of the graduations. Thanks for linking to Keep In Touch.